We all know driving is a gamble. Every time you sit behind the wheel you're playing craps with fate and the stakes are high. For this kind of game you can't use any ordinary dice. You need something bold, something ßashy, something fuzzy. This set of two 3" classic fuzzy dice comes on a string for hanging from your rearview mirror, and are made of a super plush acrylic-fur material. Comes in assorted colors with black dots made of vinyl. 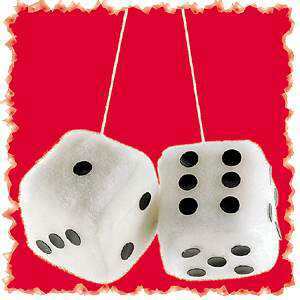 Remember the good old times with our classic fuzzy dice.